We have a curriculum which clearly identifies what knowledge we want students to take away with a focus on permanent learning rather than just regurgitating at the next assessment so teachers have long term plans that focus on sequences of learning and long term memory support. We have a curriculum that prioritises high challenge content and vocabulary, supporting students in becoming articulate, informed young people who can compete against the very best in whatever their chosen field is. Our curriculum focuses on enabling students to be the people they want to become – citizens, scholars, ambassadors. Building social and academic skills in tandem. develops the spiritual, moral, social and cultural development of all students, whatever their background or beliefs. We follow the National Curriculum for KS3. Teaching hours for individual subjects across all key stages can be seen here. Students study English, maths, science, humanities (history, geography, RE & PSHCE combined), a language, music, drama, art, DT (food, resistant materials & electronics/CADCAM), IT and PE. We follow the Hertfordshire Agreed Syllabus for RE, and citizenship is taught through humanities and PSHE. Students who require additional support in literacy are withdrawn from languages for extra support. Most students return to languages lessons in Year 8, and some continue to receive literacy support. Most subjects are taught in mixed ability groups, usually form groups. In languages in Year 7, students in one half of the year group study French and those in the other study German. In Maths, students are taught in mixed ability groups, with extra provision for the highest and lowest attainers. In PE students are taught in ability sets across a half year. Students study English, maths, science, RE, history, geography, languages, music, drama, art, DT (systems & control, food, and engineering), IT and PE. We follow the Hertfordshire agreed syllabus for RE, and citizenship is taught through RE and PSHE. Students in Yr 8 who still require additional support in literacy are withdrawn from languages for extra support. In English, science, languages and PE, students are taught in ability sets across a half year; students may move between sets during the course of a year. In maths, students are taught in mixed ability groups, with extra provision for the highest and lowest attainers. In languages in Year 8, students continue with German/French (depending on what they studied in Year 7). The most able students are offered the opportunity to take two languages by studying Spanish as an additional language. As in years 7 & 8, students study English, maths, science, RE, history, geography, languages, music, art, DT (food, systems & control and resistant materials), IT and PE. We follow the Hertfordshire agreed syllabus for RE, and Citizenship is taught through RE and PSHE. In languages in Year 9, students continue with the language or languages they have studied in Year 8. The year 9 options process involves all stakeholders via interviews with all students and their parents; these are preceded by presentations, assemblies and work in PSHE and tutor time on making good choices. In order to raise achievement and support student progress, our KS4 curriculum offer is comprised of 4 pathways: Purple, Green, Yellow and Blue. 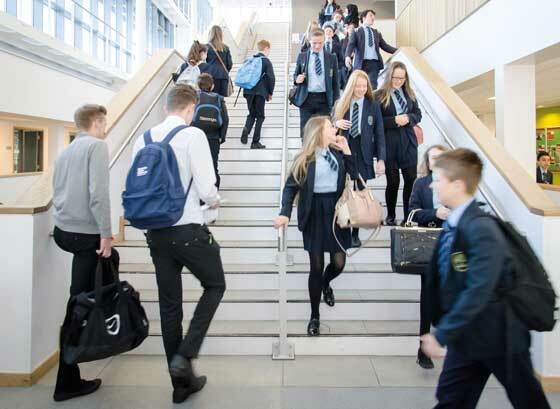 Students are placed on a pathway based on their aptitudes and ability, with each pathway allowing students the opportunity to achieve their best grades from a choice of subjects which is both broad and balanced. All students study GCSEs in English language, English literature, maths, science & RE (through either a full course GCSE or non-examined RE for some students). All students study two science GCSEs. The most able students in KS4 are offered the opportunity to study triple science. Citizenship is taught through GCSE RE and PSHE. The Yellow pathway, through a reduced number of option choices, provide students with the opportunity to complete the Prince’s Trust Certificate in Personal development and Employability Skills which supports their studies in other subjects. There is an extensive and varied offer of GCSE and level 1 & 2 technical/applied courses. For the full range of subjects click here. A similar pathways model exists for transition into KS5 to raise achievement and to support progress. A student’s pathway is determined by the APS of their best 6 GCSEs, and their English and maths GCSE results; this is set initially based on target grade data, and then reviewed once after the mocks based on teacher predictions, and a second time after final teacher predictions at the end of the spring term. The Year 11 options process involves all stakeholders. There is a Post-16 evening in the Autumn term, followed by interviews with all students and their parents at the beginning of the Spring term, during which students share their initial choices and future aspirations. We offer a full range of A level and level 3 applied/technical courses across the pathways, as well as resit maths and English GCSEs (or a level 2 equivalent) for those who did not achieve them at the end of Year 11. For the full range of subjects click here. The extra-curricular offer at KS5 includes the EPQ, Young Enterprise and Duke of Edinburgh Award scheme. Our post 16 offer is enhanced by the consortium arrangements with the other Stevenage Sixth schools. This allows us to develop a level 2 pathway for students who have not yet secured 5 A*-Cs by the end of Yr 11. Students have access to a wide range of enrichment and extension activities offered through extra-curricular activities. These include lunchtime & after school clubs, house activities, sporting activities & competitions and residential & day visits. For details of the full extra-curricular offer, click here. These contribute to the highly effective promotion of SMSC across the school. We encourage all students and their families to complete super curriculum activities designed to enhance and extend classroom learning. Further details about our super curriculum offer can be found here.